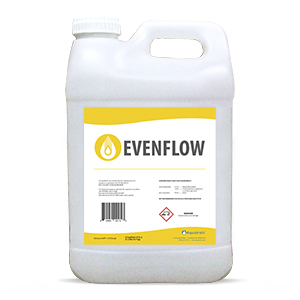 EvenFlow is a patented soil surfactant technology that enhances the infiltration and penetration of applied irrigation water, rainfall, and water soluble fertilizers in agricultural soils. EvenFlow can be used for early growing season soil applications to promote uniform crop emergence or throughout the growing season to improve irrigation efficiency. EvenFlow ensures that water penetrates the soil quickly and evenly. The photographs below show the effects of EvenFlow on a water repellent soil in a laboratory setting. While the untreated water drop fails to infiltrate the soil surface, the water treated with EvenFlow quickly penetrates the soil. This enhanced infiltration and penetration ensures the delivery of soil directed inputs and reduces the amount of water lost to run-off or evaporation during rainfall or irrigation events. Capillary uptake is a laboratory measure of infiltration without the effects of gravity. In essence, capillary uptake measures how well water moves through a soil. 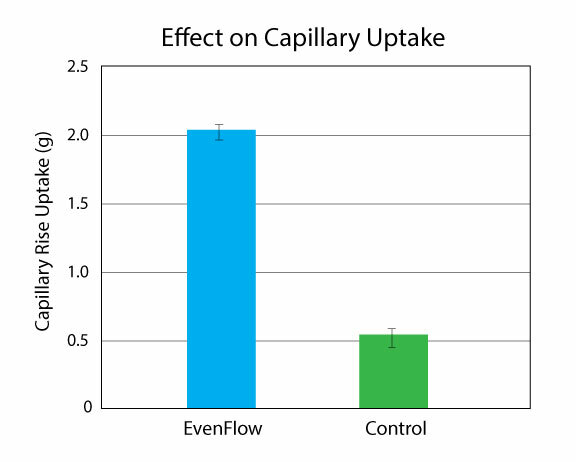 The chart to the right shows that EvenFlow greatly increases capillary uptake compared to the untreated control, signaling better movement of water through the soil. By improving the infiltration, penetration, and movement of water into and throughout the soil profile, EvenFlow ensures more uniform delivery of soil directed inputs, such as fertilizers and creates more favorable conditions for crop emergence. When used over the course of a growing season, EvenFlow has the potential to greatly increase irrigation efficiency for growers and reduce overall water and fertilizer costs. For more information about EvenFlow, including pricing and availability, contact your local Aquatrols distributor today!